The Royal flatbed typewriters were the only unique design that the Royal company put on the market. But when it came to work horses, the company introduced one price winner after the other for decades. And from the 1930s on, the line included portables. The Quiet De Luxe was the flagship for many years. In the late 1940s Royal had the Quiet De Luxe redesigned by Henry Dreyfuss who came up with the model shown on this page. 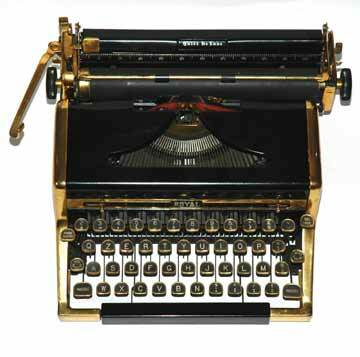 It is not the kind of machine that deserves a place in a museum for antique typewriters, except that this one is... made of gold. Not solid gold, but plated. The gold-plated machine was produced in a limited edition and sold at a considerable price. Apparently, one of them was owned by author Ian Fleming.